Learn more about urban agriculture in NYC by following these 11 organizations bringing fresh, local food to the big apple. Overview: The Battery Urban Farm educates New Yorkers on the benefits of sustainable agriculture. Volunteers from all over the city work together to maintain the gardens, whereas apprentices mainly work in the farm to harvest produce – all of which is donated to nearby schools and communities. What’s interesting: Originally an idea of Millennium High School’s Environmental Club, The Battery Urban Farm has deep ties with education. Most of their harvest is donated to downtown schools, and classes may even adopt a garden plot to maintain throughout the school year. Latest Campaign: The Forest Farm -The Forest Farm offers a different view of nature than that of a normal farm. Shaded, and filled with native plants, fruits, and vegetables, students who visit the ‘forest’ learn not only about harvesting, but explore the aspects that make up a thriving ecosystem. The Forest Farm: Shaded farm to enjoy and learn about ecosystems. 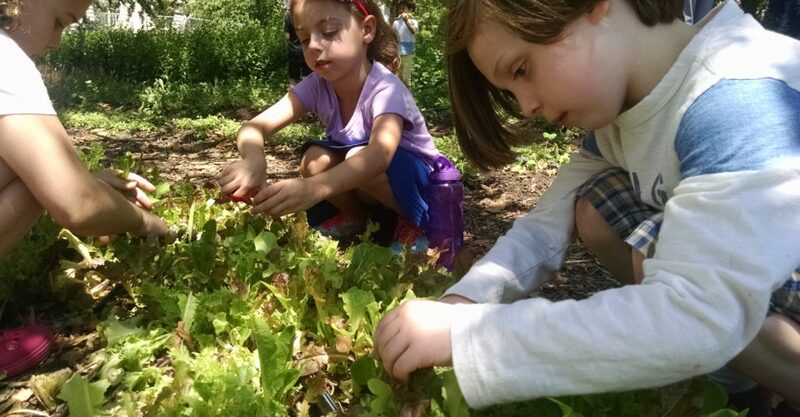 Garden to School Cafe Program: Fresh farm produce is donated to schools. School Plots Program: Classes may adopt a garden plot to maintain for the year. Student Farmers Program: Public school students grades K – 3 meet at the farm bi-weekly and participate in hands-on agriculture classes. Apprenticeships: The Battery Urban Farm accepts apprentices who wish to gain experience in maintaining farms and gardens. Overview: GrowNYC is a hands-on nonprofit organization that provides free tools and services anyone can use in order to improve NYC and the environment. Their Community Gardens program builds and maintains community and school gardens throughout the five boroughs. What’s interesting: Besides managing 90 community gardens we’ve built, every year we support hundreds of gardens across the city, organizing large-scale volunteer days, building green infrastructure, providing ongoing technical assistance, donating plant materials, and hosting our annual plant sale so 500+ groups can purchase plants at wholesale cost and in wholesale quantity. The nonprofits website provides resources including: a green infrastructure toolkit, a planting calendar, and other how-to’s. Latest campaign: Alongside the NYC Parks Department’s Green Thumb Division and the Department of Education’s Office of School Food, GrowNYC created ‘Grow to Learn: New York City’s School Gardens Initiative’. This initiative works to place sustainable gardens in all of NYC’s public schools, providing students with healthy food and hands-on agriculture education. Green Infrastructure Toolkit – designed for homeowners and small scale gardeners, this guide provides techniques to preserve gardens in harsh weather. Overview: Farm School NYC’s mission is to train NYC residents in urban agriculture, in order to build self-reliant communities and inspire positive local action around food access and social, economic, and racial justice issues. Our courses are taught by experts in the field and focus on a wide range of topics from social justice issues, to urban planting techniques, to grassroots community organizing. What’s interesting about this organization: Farm School NYC provides a certificate program in addition to offering individual classes. In November 2016, Farm School NYC will launch an Accelerated Certificate in Urban Agriculture, offered in partnership with the Youth Farm. Overview: Gotham Greens is a global pioneer in the field of urban agriculture and a leading regional producer of hyper-local, premium-quality lettuces and herbs. The company owns and operates 4 urban rooftop greenhouses in NYC and Chicago and provides its diverse retail, restaurant, and institutional customers with a reliable, year-round, local supply of produce grown under the highest standards of food safety and environmental sustainability. What’s interesting about this organization: Gotham Greens’ rooftop greenhouses, which span over 170,000 square feet, grow produce using ecologically sustainable methods in technologically-sophisticated, 100% clean electricity powered, climate-controlled urban greenhouses. Organizations like Gotham Greens show that even crowded, bustling cities can have access to fresh, high quality, and sustainably grown produce. Their produce is 100% pesticide free and is harvested fresh daily, 365 days a year. Latest campaign: #ASaladADay: share your greens and tag #ASaladADay for a chance to be featured on their feed and win a farmer’s bundle of Gotham Greens! Overview: Hanging above the endless cafes and restaurants of midtown NYC, Hell’s Kitchen Farm Project grows fresh produce on the 4,000 square feet of the Metro Baptist Church rooftop. What’s interesting about this organization: The project has had to find innovative solutions for their produce to thrive on a concrete roof. Instead of harvesting on fields, HKFP utilizes kiddie pools – a cheap and lightweight way to preserve space. Latest campaign: HKFP is currently in the middle of this season’s CSA, giving low-income neighbors the opportunity to pay half price with SNAP benefits. They are also three months into their sixth growing season, and have harvested more than 130 pounds of produce so far. Campaigns that stand out: HKFP has its own community-run CSA. Members are asked to donate at least three hours of their time to the Project. Overview: Transforming open space in under-resourced communities for a greener, sustainable NYC. What’s interesting: New York Restoration Project (NYRP) is driven by the conviction that all New Yorkers deserve beautiful, high-quality public space within ready walking distance of their homes. We plant trees, renovate gardens, restore parks, and transform open space for communities in New York City’s most densely populated and least green neighborhoods. NYRP gardens are not only beautiful – they function as urban farms, free social gathering spaces and outdoor classrooms in areas of the city where public parks or other open spaces do not or simply cannot exist. In some spaces, NYRP gardeners even raise chickens on site, and offer classes on how to manage your own chicken coop. Latest campaign: The Haven Project, launched in 2015, a transformative plan to renovate and revitalize a network of open spaces in the South Bronx. The Haven Project aims to demonstrate measurable health and social outcomes resulting from an improved physical environment at the neighborhood scale. In July 2016, NYC City Council awarded $2.75 million in capital funding for the 132nd Street Pier Park. Overview: Brooklyn Grange Farm is a rooftop farming, green roofing, and community building business located in NYC. Operating the world’s largest rooftop soil farms, BG produces over 50,000 pounds of organic produce per year. They also act as a living laboratory, host educational programming and events, and provide consultation on urban farming, design, and installation services to clients around the globe. By making use of the vacant spaces of New York City, BG Farm seeks to create a sustainable model for urban agriculture in addition to nurturing both the environment and public health. What’s interesting: Brooklyn Grange takes a unique, multi-faceted approach to urban farming: cultivating 2.5 acres of rooftop according to organic practices increases access to fresh, healthy foods, but food production is just one of Brooklyn Grange’s goals. They also aim to connect urbanites with food, farming, and nature through education and events; partner with numerous non-profit organizations throughout the city; and to add more green space to the community by designing and installing rooftop farms, terrace gardens, backyard homesteads, and green spaces for private clients and organizations around the city and beyond. Latest campaign: In April, Brooklyn Grange co-founder Anastasia Cole Plakias published a book about the team’s experience launching and operating the business. The Farm on the Roof: What Brooklyn Grange Taught Us About Entrepreneurship, Community, and Growing a Sustainable Business is an inspirational story full of lessons that will be helpful to anyone who aims to create a business that does more than just turn a profit. Refugee and Immigrant Program: Brooklyn Grange fosters the talents of recent refugees and immigrants who bring with them agricultural techniques from their home countries. In collaboration with the Refugee and Immigrant Fund (RIF), immigrants and refugees are granted work experience, consultation, and even paid fellowships in agriculture. City Growers: This hands-on program connects the city’s youth to agriculture. Students learn about food production, the urban landscape, and the natural sciences in order to learn where their food comes from. Overview: One of NYC’s latest urban agriculture sites, Riverpark Farm grows fresh produce for the nearby Riverpark restaraunt. The Farm also engages the public in urban farming through visits, workshops, and volunteer hours. What’s interesting about this organization: With the Riverpark restaurant thriving on its year-long supply of locally grown produce, Riverpark Farm is a pioneer for sustainably-supplied restaraunts in the city. Overview: Bushwick City Farm is actually the pilot program of City Free Farm, an organization that seeks to spread urban agriculture and access to healthy food across the city. Their farms not only provide fresh fruit and vegetables to the public: they also raise chickens and serve as a center for community gatherings. What’s interesting: City Free Farm is solely operated by the labor of volunteers. As such, all produce is free of charge! The farm’s motto, “give-as-you-can, take-only-as-you-need”, encourages responsible and respectful use of public space. Latest campaign: Free City Farms is transforming Stockton Street – originally a vacant lot – into a larger version of their Bushwick farm. Volunteers are currently building this work in progress. Facebook name: East New York Farms! Overview: Our work includes two weekly farmers markets, a Youth Internship Program serving 35 children, a gardener assistance program, maintenance of three farms, a mini-grant program, and a Community Educator program that leads over 85 cooking demonstrations per year. What’s interesting about this organization: Community gardeners are the backbone of East New York Farms!. In addition to their work growing food, they serve multiple roles as vendors, community educators, youth interns, board members, and beekeepers. All of this is in addition to their lives as parents, teachers, students, religious leaders, librarians, transit workers, grandparents, artists, and entrepreneurs. We believe the resources to change our food system are right here in our community. Latest campaign: In 2015 we started the Pink Houses Community Farm in collaboration with residents of the NYCHA Pink Houses. All of the food that we grow on our 1/2-acre farm is given away. Teen Internship Program – this program nurtures the next generation of food activists by training teens in farming, leadership, and entrepreneurship. Community Education – This program provides gardening, cooking, and health workshops to nearby neighborhoods. Overview: Eagle Street Rooftop Farm is a 6,000 square foot organic vegetable farm located on a rooftop in Greenpoint, Brooklyn. During New York’s growing season, farmers supply an on-site farm market and deliver fresh produce to local restaurants via bicycle. The Farm-Based Education team also partners with the organization Growing Chefs to host educational and volunteer programs. (info taken from NYC food policy interview).